One of the first beauty stops I knew I had to do was visit a Jjimjlbang. I had heard so much about it from my travel buddy Julie. There were a few things I was looking forward to like the body scrubbing, hot springs, and great steam rooms, but the idea of getting naked was not on my to-do list. 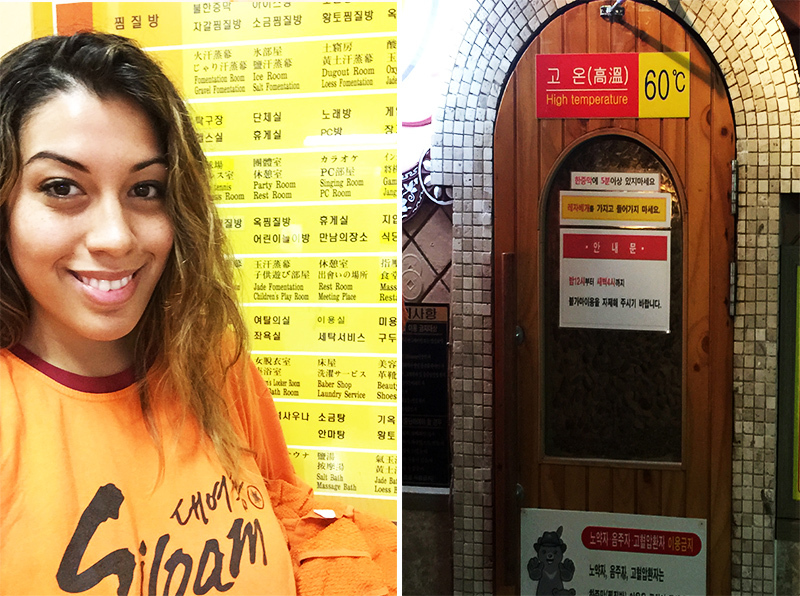 We headed to our first bathhouse that was walking distance from our Airbnb called Siloam. 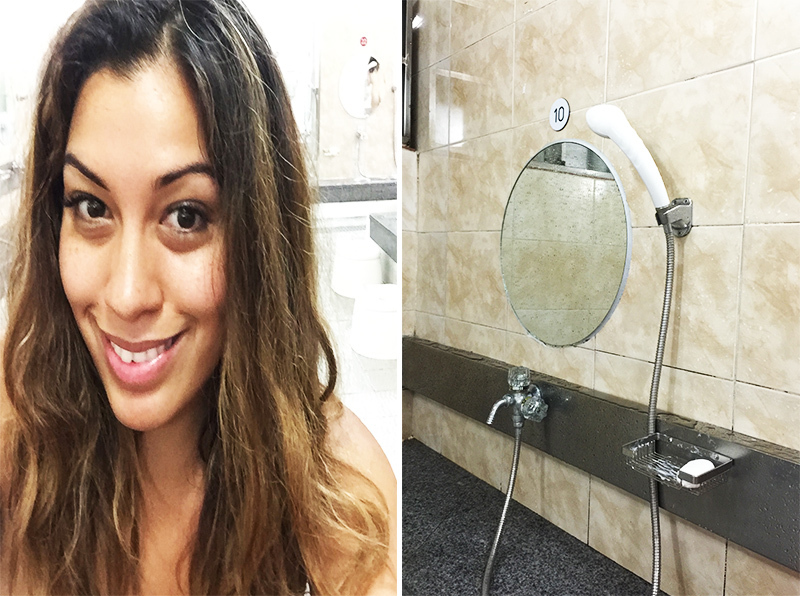 At first glance, it looked quite uninviting but for less than $8.00 we were given an authentic introduction to the art of bathing. We were given our oversized shirts, and loose shorts that are required to enter the spa and bravely took our first step in. As we walked around, we def stood out, two Americans, me being curvaceous and darker than most, but I was up for the challenge. Besides that the Korean women looked unbothered and by the looks of it the only thing they probably saw as shocking was the baby look to our flowers. ( Cough Cough) Pubic Shaving isn’t a popular beauty tradition in the Asian Culture. There we were ready to do the much anticipated naked walk to the pools. As I took my 1st steps, I could feel the confidence bursting. The mental reminders that I’m the hottest, sexiest girl in the world. What do they say? Fake it till you make it. First stop the showers. Before entering the steamed pools, you have to scrub down, from head to toe. There are over a dozen shower heads, and washing stations. Then you enter spa heaven furnished with hot tubs, showers, saunas and massage tables. You have pools at all different temperatures, infused with unique ingredients like Green Tea to enhance skin, Korean rice wine for stamina, traditional herbs such as ginseng for overall health. So where did this awesome idea come from? It’s said that the average household in Korea didn’t have bathing facilities. So they built this, all-in-one bathing activity that the whole family could enjoy. Since they couldn’t take more than one shower a week, they had to make it a good one. That’s why these spas are equipped with endless ways to get as clean as possible. Hot Baths detoxify the body and aid with metabolism, fatigue, body aches, anti-aging, stress circulation, and fertility. The whole time you soak, sweat, exfoliate, and purify. 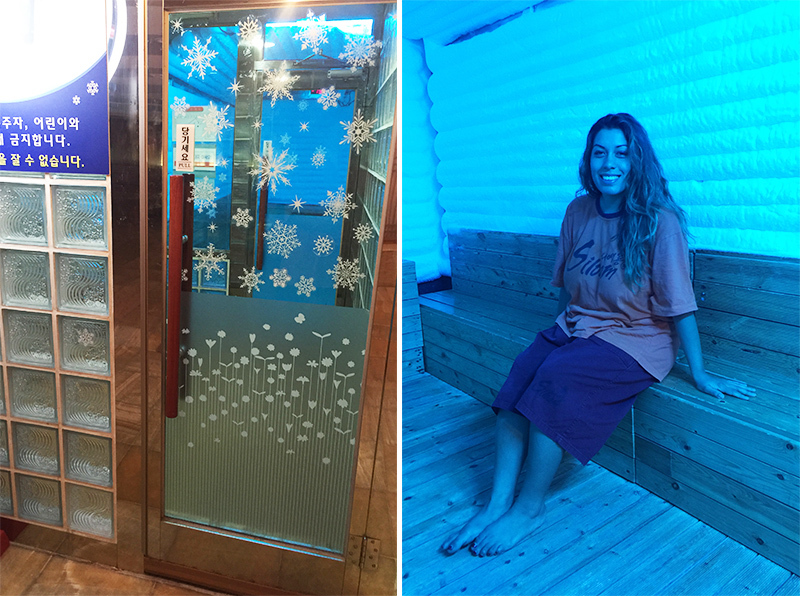 After bathing, you can relax in one of the heated rooms that are from freezing temperatures to extremely hot. Often the elements used in the rooms have a traditional Korean medicinal purposes in each room. This was definitely an authentic experience to the Korean Jjimjilbang. I would deff add it to my list of must things to do while in Korea. I will be sharing my experience in another location which is more tourist friendly. Stay tuned.